Damn Arbor: Ann Arbor Update: an homage to Arbor Update? Ann Arbor Update: an homage to Arbor Update? I noticed a new Tumblr earlier this week, Ann Arbor Update. The name reminds me of the late, great Arbor Update, back from the golden age of blogging in Ann Arbor. 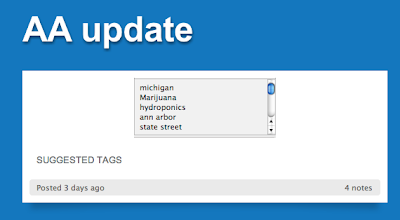 Though as you can tell, from the picture of suggested tags above, Ann Arbor Update focus much more on cannabis related posts rather than City Council agendas.